Our "Pride of the Working Class" Silly Vassily http://www.fanart-central.net/pictures/user/TeeJay87/843313/Comrade-Obvious & http://www.fanart-central.net/pictures/user/TeeJay87/840016/Silly-Vassily has recently started a socialist revolution in fashion - he began with wearing fatigues made of unpleasant in touch low-quality cotton and fur hats in the middle of summer heat only to have his tiny brain polluted by lies spread by cultists of Solanas about gender wars. 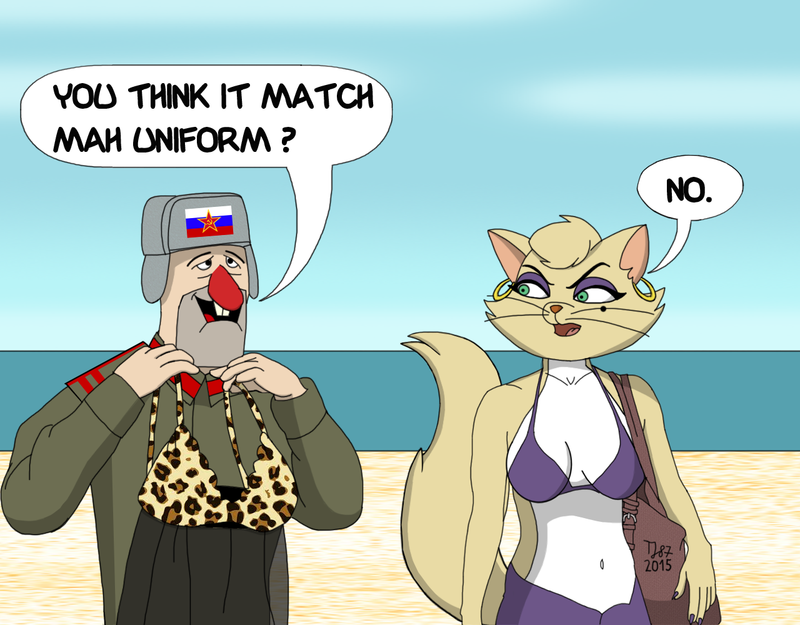 Nobody knows, how did Vassily obtain the sleep wear he's presenting to Delilah http://krypto.wikia.com/wiki/Delilah . The only certain thing in this situation is that leopard spots have never matched rotten olive drab. Silly Vassily belongs to me. ah, the ravages of vodka!!!! - nowadays, Vassily has gone for philosophy http://www.fanart-central.net/pictures/user/TeeJay87/843313/Comrade-Obvious . But what is a ruskie without vodka? LOL I can imagine that. You have been my reason of joining here! I've based the design of Vassily's nightwear on clothing from Fallout 3/New Vegas http://fallout.wikia.com/wiki/Naughty_nightwear_%28Fallout:_New_Vegas%29 , just with switched colors.